I had an OMG moment this morning, sunday september 28, 2014, when I saw the headline in the print version of the NY POST article "Bad Teachers 'Pay To Stay'" by Susan Edelman. First, who are bad teachers? I have written before and will keep writing that I certainly do not know who a bad teacher is, in most cases where this term is used. I know that whoever did not care about or teach anything to any of my four daughters was, in my opinion, not a "good" teacher, but I cannot speak for any other person, parent or student. See one of the latest posts on Diane Ravitch's blog about Adam Urbanski and the complicated process of evaluating teachers. I certainly did not know that I would be quoted under that headline. The online edition of the sunday NY POST had a better headline - see the article posted in full, below..
What I told Ms. Edelman was that when an educator is charged with misconduct or incompetency, and sign up for a NYSUT attorney, in many cases the NYSUT Attorney tries very hard (sometimes, in my opinion, abusively) to get the educator to resign, retire, leave town, or settle. Anything but go to a hearing. I believe the NYSUT Attorneys know how much of a due process disaster the hearings are, from the viewpoint of defending an educator's rights. After watching the attorneys work at 3020-a for almost 8 years, 2003-2011, I thought there was a better way to defend, and started as a paralegal advocate in defense of Respondents brought to 3020-a in 2011. No one who is innocent of charges should be forced into a settlement of any kind. You can win a 3020-a. The shocking clauses in all settlements are the give-backs, ie agreement to pay thousands of dollars and/or take many hours of Professional Development (PD) on classroom management, lesson planning, Common Core, etc. Where does this money go? No one seems to know. I wrote a FOIL request to the New York State Education Department. No information there. I wrote a FOIL to the New York City Department of Education. No answer. If the educator really has done something terrible, then a settlement is a good idea. But if an educator is threatened, yelled at, and disrespected for no reason, and the charges are not valid (made up by a hostile administrator) and then is told he/she will be terminated if he/she doesn't settle, then there is something very wrong. This is, in my opinion, extortion. Educators who know they are innocent just should terminate any representation by anyone who is abusive or disrespectful, and hire someone else. Also in all settlements are clauses which say the signer of the agreement cannot ever sue the Department for anything that has happened to bring about these charges. Really? My suggestion is this: the minute you receive your charging packet with your specifications, write and file a Notice of Claim. Notarize your signature and send to the NYC Comptroller's Office as well as the Corporation Counsel via certified mail, return receipt requested. You then have a year and 90 days to sue any public agency personnel who have harmed you. And, my quote in the article below does not refer to the so-called "bad" teachers, but refers to all the "good", innocent teachers and employees who are threatened, accused of things they did not do or did not intend to do, and are considering leaving their jobs. This is not good for the children in the classes of those excellent, often veteran tenured teachers, because learning needs continuity. The Department of Education doesn't care about the kids. This is obvious. I wonder if NYSUT Attorneys or Reps care, either, but that's another post. The city Department of Education secretly settles with most teachers accused of misconduct or incompetence, letting them pay a fine and return to classrooms — but leaving students and parents in the dark. Teachers yanked from schools for abuse of students, poor performance and many other offenses get charges dropped if they admit to some lapse, pay thousands of dollars in payroll deductions and take a class or workshop, documents obtained by The Post show. A Queens teacher who denied squeezing a kid’s neck and throwing an object that struck another kid was offered a $10,000 settlement, but bargained it down to $2,500 and returned to the same middle school. A Brooklyn teacher rated “unsatisfactory” three years in a row saved her job by paying the DOE $6,500 and taking workshops on lesson planning, instruction and classroom management. She was put in a pool of unassigned teachers who substitute — and kept her $100,049-a-year salary. A Brooklyn social worker making $82,147 a year, who billed the DOE for service to kids she didn’t provide, kept her job by paying $3,000. Bernadette Camacho, a former teacher at the Gateway School of Environmental Research and Technology in The Bronx, agreed in May 2010 to pay $6,500 and see a shrink for a year to keep her job after emotional outbursts with students. Her case became public later when kids accused her of cursing and insulting them at Hillcrest HS in Queens. Finally, an ­arbitrator approved her firing. Former DOE officials involved in efforts to fire weak or abusive teachers say settlements have ballooned because they skirt the long and costly hearings that state law requires to dismiss tenured educators. The city not only has to prove a teacher’s wrongdoing or incompetence, but make the case that he or she can’t or won’t improve. “The real problem is that the legal standard does not prioritize the best interests of kids,” said Dan Weisberg, the DOE’s former chief of labor policy. In a recent case, shocked parents at PS 101 in Forest Hills, “The School in the Gardens,” learned that science teacher Richard Parlini returned this fall after repeated student complaints against him. The DOE said it had substantiated six instances of verbal abuse and corporal punishment since 2010. But when Townsend and Nakia arrived downtown for Parlini’s hearing last June, it was called off. “They told me he settled,” she said. The DOE let Parlini pay $2,500 and take six hours of training to keep his $75,092-a-year job. “It’s outrageous that he can just pay a fine, get a slap on the wrist and go back to his paying job, while the kids have to see him ­every day,” Townsend fumed. The ratings in Néw York are referred to as HEDI: Highly Effective, Effective, Developing, Ineffective. A commenter on the blog recently said that "Developing" is considered a low grade but she hoped that she was "developing" every day as a teacher. "Each year, we re-negotiate our APPR agreement with the District to do all we can to make it less damaging to our student and more fair to teachers. "We are making progress in reducing the number of Rochester teachers (be)rated as Developing or Ineffective (40% in 2012-2013 but 11% in 2013-2014) and increasing the number rated as Effective or Highly Effective (60% in 2012-2013 but 89% in 2013-2014). Just one year ago, only 2% of Rochester teachers were rated as Highly Effective. This year, that number increased to 46%. "Why such a huge fluctuation? Maybe it's because we re-negotiated the agreement; or because teachers set more realistic SLO targets; or because the NYS Education Department adjusted the cut scores in ELA and Math; or because huge fluctuations are typical of invalid and unreliable evaluation schemes. Who knows? In any event, we continue to press for the total abolishments of APPR. "Meanwhile, we are negotiating a successor agreement that would further diminish excessive testing of students and wrongful rating of teachers." Great news for e-accountability!!! (That's the name of my Foundation, a 501 (C) 3 to hold people accountable for their actions). Send in these notes and comments!!! With names. I also have a trademark for "A For Accountability"
Please share your experiences with ATR Field Supervisors here in the comments. Is Carmen Farina's political agenda unraveling? STATEN ISLAND, N.Y. -- Johannah Chase is out as the Department of Education's chief executive officer of special education, the Advance has learned. Her ouster, after only six months in the position, comes after the Advance reported that Ms. Chase had no license in supervision and administration; no special education experience, and an expired teaching license, and a number of articles reporting on special ed problems under her watch. Her replacement, announced Monday in an in-house memo from Deputy Chancellor Corinne Rello-Anselmi -- a copy of which was obtained by the Advance -- is Christina Foti, currently principal of PS 231 in Brooklyn. The memo did not indicate whether Ms. Chase was leaving the DOE system, or why she was leaving her special ed post. Acknowledging she had "mixed emotions" about Chase's departure, and while wishing her well, the deputy chancellor, in her memo, also noted, "it is essential that the new leader of the Special Education Office have a demonstrated commitment to students with special needs and solid leadership skills." 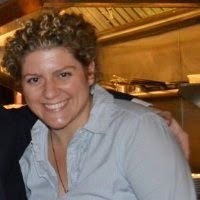 Ms. Foti has a bachelor's degree from Vassar; a master's degree in special education from the City University of New York and a postgraduate degree in education leadership from Hunter College. She has worked as a special education teacher, assistant principal and as a principal in District 75, which is comprised of special education schools throughout the five boroughs. "In these roles she has developed skills in instruction, writing quality IEPs [individualized education plans], and professional support, as well as a deep understanding of the Shared Path framework," noted Ms. Rello-Anselmi, referring to the DOE's ambitious plan to revamp the special ed system. The special education office is in charge of day-to-day management of the system, which serves more than 200,000 students. It involves supervising teams at 13 sites in all five boroughs, with more than 800 field staff; overseeing the administration of federal and state grants, and ensuring compliance, implementing services to children and working with parents, advocates, community members and union officials. A central policy shift in the "Shared Plan for Success" reform is "home-zoning" of special education students. In the past, a student with a particular special need would often be placed at a school with the resources best suited to meet that need. Under the reform, the student remains at his or her zoned school and the school is now responsible for providing the service. While the intended benefit is to keep students close to home, problems frequently surface when the school does not have the required programs or staffing in place. The reform is aimed at "home-zoning" all students, except the most extreme cases, which are shifted to an appropriate District 75 special education school. But special education staff, parents and advocates complain that resources are scarce; parents say their children are not being served, and some say their child's individualized education plan (IEP) isn't being followed. Those responsible for delivering services to students in need complain they are mired in bureaucratic paperwork, hampering their efforts. Describing her philosophy of learning on her LinkedIn profile page, Ms. Foti wrote: 'It is my belief that all children, irrespective of disability, can rise to meet expectations when caring professionals provide high quality programs that support the academic, physical and social development of students." Special education advocates welcomed news of her appointment. "If she can live up to her philosophy she'll be great for the kids, the parents, teacher and professionals. It's all about understanding the children and their needs. It sounds really simple, but to find someone who really understands a child is not easy," said special education advocate Laura Timoney, a member of the Community Education Council and parent of a special-needs child. 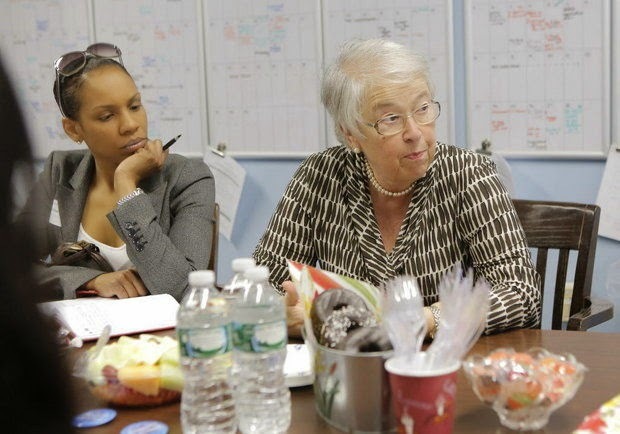 The ouster of Ms. Chase and appointment of Ms. Foti reportedly was endorsed by City Schools Chancellor Carmen Farina, who has heard complaints from all sides during her visits to Staten Island and has made special ed reform one of her priorities since she was appointed by Mayor Bill deBlasio in January. Ms. Chase was appointed special ed CEO in March. Since then, the Advance reported, several key administrators in her office were also found to have little to no teaching or supervisory experience in special ed, or lacked state certification in education administration and supervision. Under her watch, the DOE mishandled $356 million in federal fundsmeant to cover special education services such as speech, occupational and physical therapy, evaluation and counseling and pupil transportation. Most recently, a backlog pf paperwork in her office was behind a delay in special ed services for non-public schools. Her office also received a storm of criticism from parents and special education advocates for slashing $250,000 from a small but successful program known as the Transitional Aspergers Program (TAP), which helps students diagnosed with Asperger's make the transition from intermediate school to high school. Money for the program has reportedly been restored after the Advance reported on the cut. It is my belief that all children, irrespective of disability, can rise to meet expectations when caring professionals provide high quality programs that support the academic, physical and social development of students. As a principal, my greatest joy comes from working with the staff, students and families of PS 231K to fulfill the mission of our school. At PS 231K, it is our mission to create a core of learners through the collaborative efforts of the students, staff, parents and community. The role of the “teacher” is not limited to the adult, but is extended to the child. In doing so, each child discovers his/her own unique potential, talents, purpose and greatness through a differentiated, interdisciplinary approach inclusive of technological as well as social emotional learning. We strive to show our students that the biggest classroom is the world around them. We do this by using all available resources to bring the world into the classroom and the classroom into the world. PS 231K students become independent, productive, problem-solving citizens that seek challenges rather than shy away from them. Interested in joining our team as a teacher, administrator, related service provider or paraprofessional? Contact me at cfoti@schools.nyc.gov. The re-assignment of six Supervisors of Psychology from the recently disbanded Cluster 3 this summer has snowballed into an avalanche of questions about how some “Supervisors of…” should receive new assignments. CSA has been in weekly, sometimes daily, conversations with the Department of Education since early August concerning Supervisors of Speech and Supervisors of Psychologists. The number of members affected has grown as the conversation topic has expanded: Now the assignments of about 30 Supervisors of Speech and 30 Supervisors of Psychology are at stake. “We believe that district-like assignments make the most sense in providing support services to schools,” said CSA President Ernest Logan. With the current system of cluster assignments, Supervisors of... may have schools in two or three boroughs. “We’re wasting valuable time sitting in traffic and looking for parking spaces,” Mr. Logan said. After the dissolution of Cluster 3 this summer, the DOE made tentative assignments for the six Supervisors of Psychology and planned to ask for feedback on the proposed placements in the remaining five Clusters, said Ms. Fuentes. During an early exchange with the DOE, Ms. Fuentes asked who would be the new rating supervisors for these members, and then opened the proverbial can of worms by asking, “What will happen to Cluster 3’s Supervisors of Speech?” Meanwhile, the six Supervisors of Psychology were tentatively reassigned. Ms. Fuentes responded by expressing her concerns as to how member preferences will be handled, i.e. what would happen if two people wanted the same assignment, and what recourse members would have if they were unhappy. (She also asked to see the assignments for the Cluster 3 Supervisors of Psychology.) The DOE’s response was a little opaque, but ultimately said experience and prior work in a specific district was to be the criteria. “Supervisors of Speech heard about the reassignments unofficially,” said Ms. Fuentes recently, “and there was an uproar from speech supervisors in terms of their assignments.” At this point, Ms. Fuentes asked Johannah Chase of the DOE’s Division of School Support and Instruction with whom she had been dealing, for a complete list of new assignments. “Our members were asking, ‘How come I got this district when I asked for another district?” Others felt they had been discriminated against, orthought one supervisor had been ‘favored’ over another.” Ms. Fuentes suggested these supervisors write to Ms. Chase. While the DOE has OK’ed assigning Supervisors of Speech in alignment with districts/ boroughs (since their jobs are closely aligned with schools,) it continues to say “no” to this method for placing Supervisors of Psychologists. The explanation is that Supervisors of Psychologists are aligned with clusters, which cross district and borough lines. At a Sept. 26 meeting, the DOE said it was having trouble compiling seniority lists for Supervisors of Speech. By Oct. 26, Ms. Fuentes said, the list was to have been delivered to her but still hadn’t arrived. As for Supervisors of Psychologists, CSA is still pushing for the DOE to assign them by district/borough, but continues to meet resistance. against the State of New York, the New York State Board of Regents, the New York State Education Department, the City of New York and the New York City Department of Education. An extension of the ongoing efforts by parents to improve the quality of education in New York State, this lawsuit seeks to declare as unconstitutional certain provisions within New York State’s Education Law that deny students the “sound basic education,” considered a fundamental right under Article XI, §1 of the New York State Constitution. Davids v. New York was filed against the State of New York — not against teachers or any union — pursuant to this State’s constitutional obligation to ensure the availability of a sound basic education for all of its children. Davids is about modernizing the teaching profession and ensuring that our education system is performance-based and not quality-blind. Above all, this lawsuit is an affirmation of the importance of teachers to the quality of students’ education and it is a challenge for all of us to do things differently to make sure our students are getting all of the resources they need to succeed. New books and desks are not enough; there must be a highly motivated, highly effective teacher in each classroom every day. Unlike California -- where Vergara v. California challenged that state’s “Last In First Out” (LIFO) provisions, dismissal provisions and tenure provisions -- we are challenging only New York’s state’s LIFO and dismissal statutes. 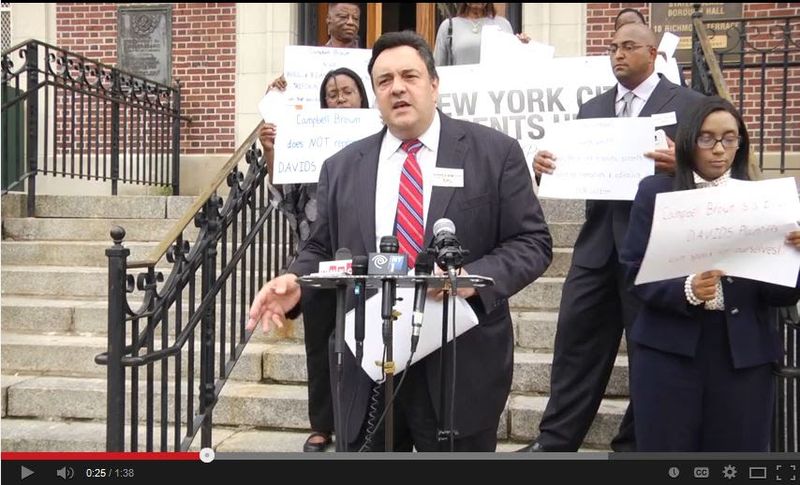 Davids v. New York will force essential changes in bad law. 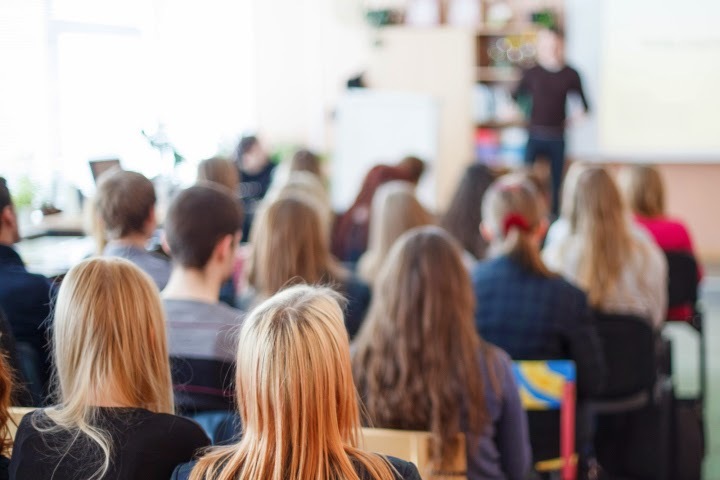 We are not challenging the tenure law in New York due to the recent amendments of the law that require school districts to consider classroom performance as a factor in granting permanent employment. The fact that New York State now considers “teacher quality” as a component of its tenure decisions is a critical distinction when comparing New York’s education laws with California’s. New York City’s parents chose to take action on behalf of their children and on their own terms, independent of other organizations and agendas. During a similar period of time, Ms. Campbell Brown, a media celebrity involved specifically with anti-union crusades also decided to pursue legal action. Her case is titled Wright v. New York. Ms. Brown’s primary interest was and remains the elimination of tenure for teachers. 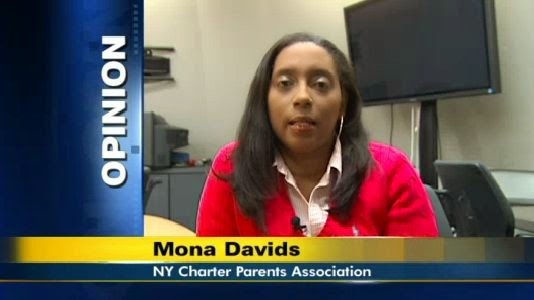 The New York City Parents Union’s lawsuit,Davids v. New York, was announced, filed with the court and served prior to Ms. Brown’s filing of her lawsuit and the announcement thereof. On August 7, 2014, New York State Attorney General Eric Schneiderman, representing all government agency defendants, filed a motion to consolidate Wright v. New York with Davids v. New York, resulting in a single case. Mr. Schneiderman also requested that the case be tried in Richmond County -- the Borough of Staten Island -- and that the consolidated case remain titled as Davids v. New York. Despite the different focus of Brown’s case, the Davids plaintiffs agreed to the consolidation and also agreed to the United Federation of Teachers' motion to intervene on behalf of their union’s members. In contrast to the Davids plaintiffs spirit of cooperation, however, celebrity Campbell Brown has engaged in a deliberate and methodical effort to undermine the strength ofDavids v. New York and sabotage the efforts of real parents to improve their children’s education. Ms. Brown has decided that having her name in the headlines is a top priority and, aided and abetted by others, she has used the threat of “economic sanctions” in an attempt to reduce financial support for Davids v. New York and the efforts of the New York City Parents Union. On August 14, the NYCPU met with Randy Mastro, Esq., a partner with the law firm Gibson Dunn & Crutcher, which was providing legal representation to the Davids v. New York plaintiffs. At this meeting, the plaintiffs were advised by Mr. Mastro that Campbell Brown and her supporters were waging a bullying campaign behind the scenes to undermine and sabotage Davids v. New York, including the threat of clients leaving Gibson Dunn as well as threats to funders of Students Matter, an education advocacy organization that organized the Vergara lawsuit, and threats conveyed to RALLY, a public relations company working with theDavids plaintiffs. The appalling extreme and sensitive nature of this situation has led involved parties to deny the threats and generate creative reasons for changing their relationships withDavids v. New York. After refusing to go “on the record” addressing or denying these allegations to reporters, and only after agreeing to deny our allegations “off the record,” Ms. Brown finally responded “on the record” in an email to former California State Senator Gloria Romero, the sponsor of the California Parent Empowerment Law and also a columnist for the Orange County Register. On August 28, 2014, after learning that Ms. Romero had confirmation of Ms. Brown's bullying from a credible Students Matter source, Campbell Brown denied our allegations in an email to Ms. Romero and proceeded to instruct Gibson Dunn, our attorneys, to respond to Ms. Romero with a statement. A mere 12 minutes later, Gibson Dunn -- our law firm with whom we had a retainer agreement – proceeded to violate attorney-client privilege by following Ms. Brown's instructions and sending Gloria Romero an email that called our allegations absurd included a statement that Gibson Dunn would no longer be representing the student and parent plaintiffs in Davids v. New York. This email and statement was sent hours before attorney Randy Mastro actually notified us – his clients -- in a short email that Gibson Dunn would no longer be representing us. It was beyond disappointing to be confronted by a bully posing as an ally. In New York City, we say “No” to bullies. As real parents with our children’s futures on the line, we will not be bullied! Celebrity Campbell Brown has chosen to use intimidation as hermodus operandi. Celebrity Campbell Brown’s ego does not deserve our praise, nor does her obsession with teacher tenure. Celebrity Campbell Brown does not represent us parents – and she will not stop our children and us from proceeding with Davids v. New York. Celebrity Campbell Brown is not the saviour of New York’s children from low-income families or black and brown children … and she has no right to represent herself as such when she chooses to use money and connections to trample on the rights of those children and their families. 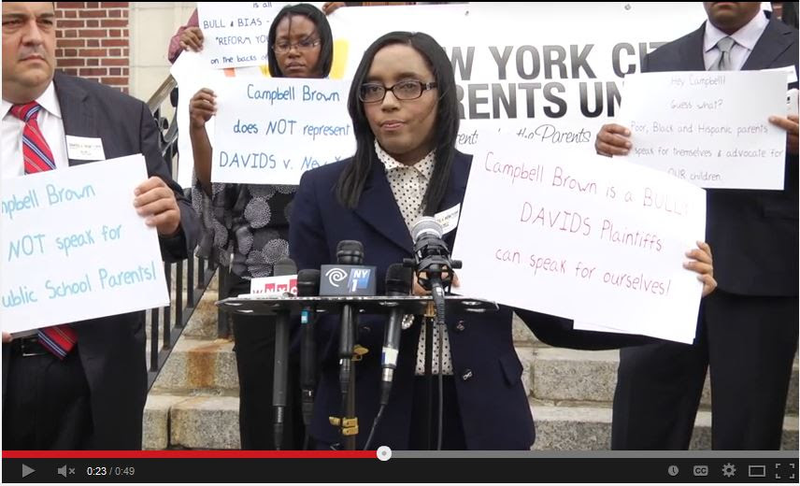 Unlike Ms. Brown's lawsuit, Davids v. New York has been organized by independent, grassroots parents with a long history of advocating on both a legislative and judicial level for our children. The parents of the student plaintiffs are members of the New York City Parents Union, a parent-led organization dedicated to ensuring that every child receives equal access to a high-quality and affordable public education. The New York City Parents Union and its members are also plaintiffs in two ongoing school funding lawsuits – actions pursued to ensure that New York's public school children receive all the school funding they are entitled to under the law per the important Campaign for Fiscal Equity court decision. Through this lawsuit, we seek to create an opportunity for education stakeholders — students, parents, teachers, legislators, and organized labor — to create a better review system that elevates teacher quality, raises the prestige of the teaching profession as a whole, and promotes access to a sound education for all students. 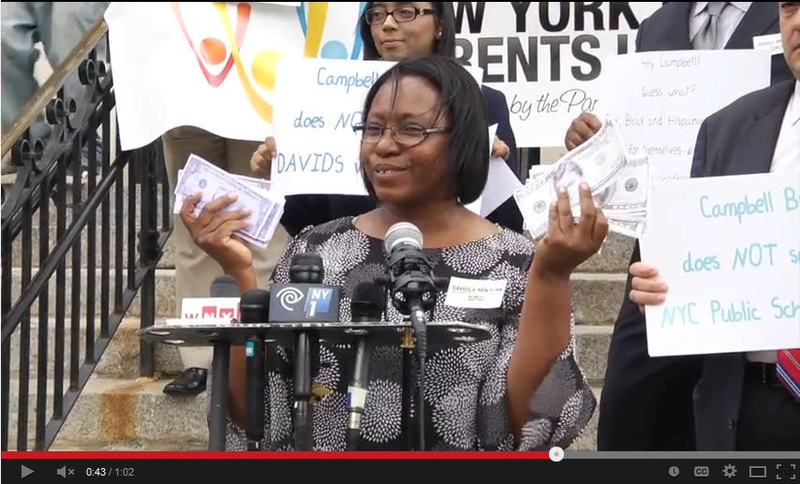 September 11, 2014 Press Conference videos of Davids v. New York parent plaintiffs speaking out against Campbell Brown's bullying, undermining and attempted hijacking of our independent, grassroots, parent led lawsuit. Click the pictures to watch the videos. Jacqueline Colson - click here to learn more about Jacqueline. Sam Pirozzolo - click here to learn more about Sam. Mona Davids - click here to learn more about Mona. Copyright © 2014 New York City Parents Union, All rights reserved. You are receiving this email because you are a parent/guardian who cares about educating all children. Whoopi Goldberg is the latest celebrity to weigh in on the topic of teacher tenure, fueling what seems to be increasing national attention to the topic. At this rate, teacher tenure may exceed the Common Core State Standards as an education policy lightning rod, even as a possible wedge issue in the midterm and 2016 elections. Given the conventional wisdom that perception is nine-tenths of the reality in political warfare, this back and forth makes sense. But it's worth taking the time to remember that tenure laws—which prevent teachers from being dismissed without cause, typically established in a hearing—are actually complex, obscure, and context-specific. State legal codes on tenure go on for pages and pages, spelling out in detail such matters as the reasons constituting just cause for firing, the timeline for filing charges and hearing cases, the type of evidence that can be presented at hearings, the appeals process, and so on and so forth. For cases of dismissal for incompetence, the picture is further complicated by disagreementsabout what constitutes an effective teacher and how to measure one. And, as with all laws, they can be implemented well or poorly. My point is that there's a lot here in the weeds to examine. We'll do our best here at Education Week to keep you above the fray and understanding these nuances .